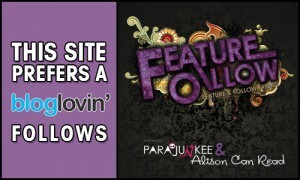 Feature and Follow Friday is a weekly meme hosted by Parajunkee and Alison can Read. Each week, they ask bloggers a question they respond to in their Feature and Follow post. I would like to be followed through Bloglovin‘. Tough one! Maybe something like: What would you do in a world without internet? Or how would you survive a zombie apocalypse? Or if somehow you can’t blog about books anymore, how would you spend your spare time? What questions would you suggest? These are awesome and creative questions! Though I don’t really want to contemplate life without internet, a zombie apocalypse (pretty sure I’d die quickly!) or not book blogging. Terrifying thoughts! 😉 Thanks so much for visiting and following my blog. Following via bloglovin’. Great questions, I am no good at making questions…lol. Congrats on being featured this week! Love your feature question suggestions! I often think about how life would be without many of the modern technologies we now have. Sometimes I think the human race would be better off without it all. I think that too sometimes. We rely so much on technology nowadays. Those are awesome questions! I messed up and answered the wrong question this week. I think though that my questions would be about book boyfriends, like who is the best and who is the worst. I love my book boyfriiends, lol! Thanks for visiting Bookworm Book Reviews and congrats on being this week’s feature! New follower on Twitter! I really like the first and second questions. Not too keen on zombies…..lol. But give me romantic vamps anytime!! Majanka is twenty-six years old and she's loved reading from the moment she finished her first book. She works as a Legal Counsel, and also has a Criminology degree. She's been blogging about books since 2010 and became an official reviewer for ind'Tale Magazine in September 2014. She promotes authors and sets up virtual book tours through Enchanted Book Promotions. She writes books for children and young adults. Find out more about her writing here. She also designs websites and graphics on I Heart Designs. On top of that, she's also a freelance editor. Find her editing portfolio on The OverAchiever. I love reading challenges! I'm participating in five challenges this year. To see which ones, and my progress, visit this page. Would you like to advertise your book here? We left some advertising space here for book covers (200x120px). Go to our Advertising page to find out our monthly rates. Majanka has read 0 books toward their goal of 100 books. Have a book you'd like to get reviewed? Please take a look at the Review Policy. Please upload one of these buttons to your own server and link back to I Heart Reading. You can browse our reviews by genre, rating, age group and date. I organize virtual book tours and other promotional events for authors on Enchanted Book Promotions. I can also help authors by setting up a custom book marketing campaign and/or PR Services. I keep track of all the books I receive, read and review on my reading log, I Heart Yearly Reads. The book covers will also be uploaded to my Facebook Page. Are you looking for a freelance editor, or a proofreader? Do you need a writer for an article, press release or blog post? Visit my portfolio over on The Over Achiever.